The First one on the left is a monocular lens. It is covered by insurance. It will correct your vision after cataract surgery, but you may require glasses for both distance and near. The middle lens is a Toric IOL. This is a Premium IOL. It will correct for astigmatism, and should allow you to see at a distance without glasses, but you will still need to wear reading glasses for up close. Toric IOL's are not covered by insurance, so you will have an out of pocket expense for this lens. The Iens on the right is a Multifocal IOL. This is a Premium IOL. It will correct for distance and near vision, greatly decreasing you need for glasses after cataract surgery. This lens is not covered by insurance, so you will have an out of pocket expense for it. 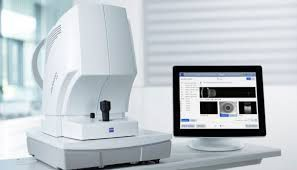 This is the most up to date technology to accurately measure the eye. 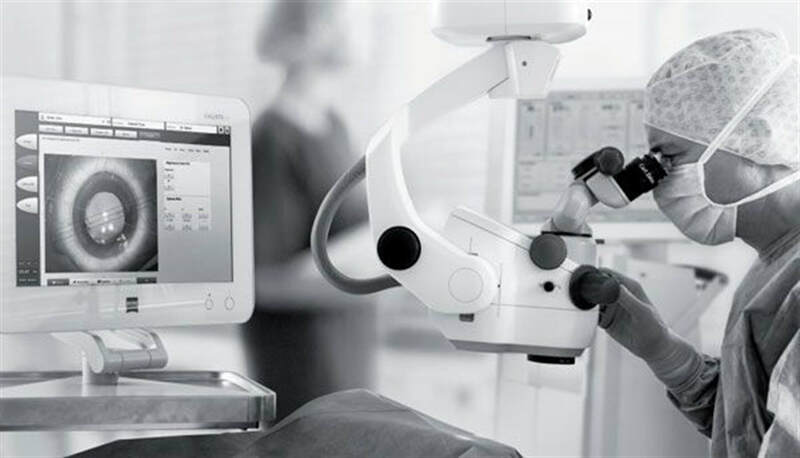 A state of the art system that integrates measurements from the IOL Master 700 with the operating microscope at the time of surgery. Visual aids are injected into the ocular of the operating microscope at the time of cataract surgery. These visual aids allow for the precise placement of premium IOL's in the eye, leading to more predictable and reliable outcomes. It is computer assisted surgery! In Dayton, Callisto Cataract Suit is only available at Samaritan North Surgery Center where Dr. Peets performs all his cataract surgeries.